The Think Tank for Arab Women (TTfAW) is an independent network of women activists, researchers, consultants, policymakers, and academics committed to achieving Arab women’s full participation in the development of their countries and the region. TTfAW brings people together to work on specific initiatives aimed at improving the status of women in the Arab region and achieving gender equality in all domains. Members of TTfAW share information, review Arab women’s realities, study best practices, identify strategies, engage in advocacy work and public awareness-raising, and influence policymakers by making recommendations for legislative, political and institutional changes. TTfAW also aims to help define the most significant emerging issues related to women’s empowerment and gender equality in the Arab region through networking, reflection, analysis, discussion, and research. The Think Tank for Arab Women officially launched in Amman, Jordan, where over twenty activists from the region convened to discuss armed conflict and its impact on women. Since its launch, TTfAW has convened two additional sessions: one in Cairo examining the main obstacles to women’s equal participation in elections and the role of women in ongoing revolutionary struggles and another in Sweden, where delegates traveled to Stockholm to meet with members of other thinks tanks and academic institutes and to Visby, where they participated in a debate at Sweden’s annual Almedalen Week on whether the Arab revolutions have helped or harmed women. 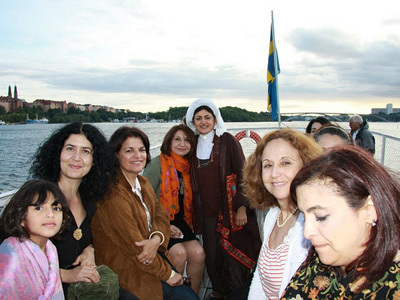 The Think Tank for Arab Women is composed of activists from ten countries in the region and additional collaborators from Sweden. Speakers and additional contributors from all across the globe have participated at individual sessions.